Every December we put up Christmas trees in our homes because it’s a tradition. But how many people know where this tradition comes from? There are many stories about the origin of the Christmas tree – some of them dating back as far as ancient Rome and ancient Egypt, and some associated with Paganism. But the Christmas tree as we know it today has its roots in good old Germany! Interested? 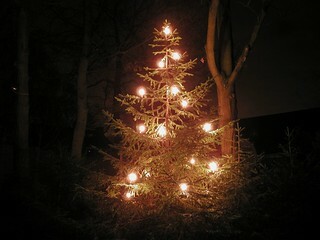 Here are three little stories about the Christmas tree in German history. This story explains why we use fir trees as Christmas trees. The story goes like this: In 722 AD St. Boniface, an English monk, went to Germany in the hopes of bringing Christianity to the country. Whilst there he found a group of pagans performing a religious ceremony around a big oak tree. They appeared to be sacrificing a child around it. To stop the ceremony, St. Boniface cut down the Oak tree. As if by magic, a Tannenbaum grew from the place the oak had been. St. Boniface regarded this as a triumph of Christianity over Paganism, and the introduction of Christianity into Germany. He adopted the Tannenbaum as a symbol of his faith. Since this time, the Tannenbaum has been a symbol of Christianity and Christmas time. This story explains why Christmas trees have lights on them. Martin Luther (1483-1586) was a German theologian who began the Protestant Reformation in the 16th century. It is widely believed that Martin Luther was the first person to put Lichter on the Christmas tree. The story goes that, as he walked through a dark forest one winter’s night, he looked up at the sky to see twinkling Sterne shining through the branches of the fir trees. He saw the Sterne as Lichter from Heaven that were guiding him home, through the dark, frightening forest, just like the Star of Bethlehem led the Three Wise Men to the stable on the eve of Jesus’ birth. Inspired, Martin Luther took a small Tannenbaum from the forest home to his family, and decorated it with Kerzen, to mimic what he had just experienced in the forest. This experience also inspired his next sermon, and saw him spread the idea to his community. It is believed that this is why people began putting Kerzen on their Christmas trees – this act was inspired by Martin Luther’s sermon, as a means of remembering the story of Weihnachten. This story explains how Christmas trees became popular in Britain. The Queen’s Christmas Tree at Windsor Castle. Published in The Illustrated London News, 1948. “Godey’streeDec1850” by Steel engraving. Licensed under Public Domain via Wikipedia. Christmas trees were already popular in Germany before they came to Britain and other parts of the world. It is said that they became popular in Britain when Queen Victoria married Prince Albert (1840). Prince Albert ordered a Tannenbaum to be delivered to Windsor Castle at Christmas time, and to be dekoriert as they do in Germany. This was not the first time a Christmas tree had been seen in England, but because the Queen had one, it became a widespread tradition which stuck. An engraving of the Royal Family celebrating around their Weihnachtsbaum was published in The Illustrated London News in 1848, after which many families adopted the tradition in their own homes. In the PBS series “Victoria” it was said that Albert was a lover of trees and forests. What was the German word for this passion for trees?